Prairie Dell dates from the late 1860s when it barely had a store. Situated on a cattle trail on the way to northern cattle markets, it was granted a post office in 1877. It closed the following year, but reopened fifteen years later. In the mid 1890s the community had 75 residents served by two stores, a drugstore and a blacksmith. Spiritual needs were served by two Baptist Churches and one Presbyterian congregation. The town’s school was one of the largest rural schools in Bell County in 1903 with a reported 129 students taught by 2 teachers. Prarie Dell peaked in 1904 with a population of 134. 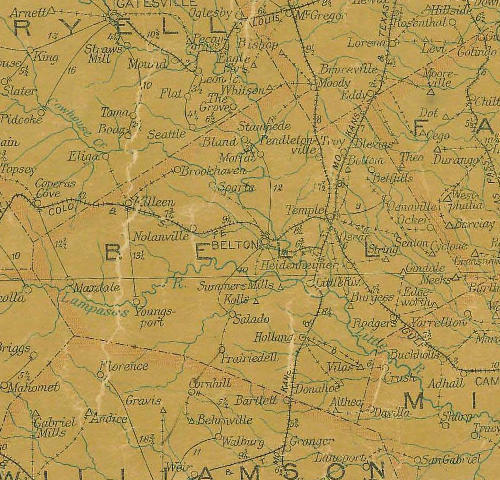 Its proximity to Belton may have stifled it’s growth and the Great Depression no doubt took a toll, but by the mid 1960s the town had just 20 residents. The 1990 census counted 12 residents with only one church at that time. Prairie Dell was once the site of a roadside attraction and later the principle set for the sequel to the movie "Texas Chainsaw Massacre."